Wow! Those renderings are amazing. Hopefully someone from CHSRA is listening. Yes, I'll second that. Great job, I hope someone in-the-know is reading this blog. San Fran's Transbay center, and now this. I can't believe that I am going to say this after god knows how many years of dreaming and planning, but this whole thing is beginning to feel rushed! Sigh. Look at China, see how they can seemingly build stuff overnight. Look at our history, how we could build great infrastructure in the 30s. Now look at us fumbling around, struggling to get this project done right. How can one not get depressed? Kudos to Richard Mlynarik and Clem for this post. A 3D model is indeed worth 1000 pictures. What surprised me is few eminent domain takings would be necessary to ease the curve. That's probably cold comfort to those affected, but with a sufficiently generous settlement, those homeowners could probably afford to purchase properties at some distance from the tracks. The model also brings into sharper relief the need to hammer out the track assignment issue. The FSSF configuration advocated before and illustrated here is better for operations. However, it also means the HSR trains traveling at 100mph+ will emit noise closer to residential buildings. In addition, central island platforms may require greater eminent domain takings all the way down the line due to the long chicanes needed to shift HSR trains laterally. Note that CHSRA is currently assuming SFFS south of Bayshore and FSSF north of it, with a trench to facilitate the transition. The apparent reason is that Caltrain wants to keep using the existing tunnels during and after construction, in part because of pressure to implement a gauntlet track for AAR plate H freight. Both SFFS and FSSF could turn out to be problematic for HSR operations whenever UPRR decides it needs to cross tracks to reach a freight spur. Granted, that doesn't happen often, but per constract between SP and PCJPB, Caltrain must grant UPRR a certain number of 30-minute windows to do its yard switching. UPRR has asked for full grade separation between HSR tracks and its own turnoffs to freight spurs. In addition, there may or not be a (minor) track crossing problem regarding the Dumbarton wye, assuming the Dumbarton rail project is not canceled. Santa Clara county, preoccupied with the BART extension, wants to get out from under its commitment due to cost escalations, falling ridership estimates and the absence of trackage rights from UPRR in the East Bay. My understanding is that the BART extension to SFO required MTC to divert $145 million it had planned to spend on the extension to Fremont Warm Springs. Last summer, SMCTA agreed to repay the favor by allowing MTC to divert $91 million it had earmarked for the Dumbarton rail project to the WSX project. That currently lists $54 million in "SFO Extension Surplus Revenue" still outstanding. If the old bridge is restored after all, it's possible that over time, traffic may increase beyond a few Caltrains per day to include e.g. UPRR's Mission Bay Haulers, a new ACE service etc. Whatever decision is taken on the track assignments will likely remain in force for decades to come, so a decision on the fate of Dumbarton rail should be taken soon. central island platforms may require greater eminent domain takings all the way down the line due to the long chicanes needed to shift HSR trains laterally . The gentle (less than 5 m) track slews can be done within less than 400 m of run length, as shown by the plan view. They do take a little bit of extra right of way, but it's not automatically true this would result in additional eminent domain takings. That's the sort of statement that fear-mongering opponents might make. The slews! The horrible, horrible slews! They're going to murder us in our beds! Hide the children! On the plan view, that salmon-color band just south of the north spiral is I-380? The 1200-meter radius is intended to fit around the existing overpass columns? Do we know their location well enough to be sure it will? 10 inches cant needed to balance at 100 mph, 4 inches actual cant-- is CAHSR going to be allowed 6 inches cant deficiency? On the plan view, that salmon-color band just south of the north spiral is I-380?Yes. Sorry. I should have had the public outreach team of graphic design communications professionals do the final version. The 1200-meter radius is intended to fit around the existing overpass columns? Do we know their location well enough to be sure it will?No. It's suggestive. There are people who are paid hundreds of thousands (each) and tens of millions (cumulatively) per year to do this stuff and have the tools to do it at millimetric precision. Above my pay grade! Of course having the tools and having a clue aren't the same thing. 10 inches cant needed to balance at 100 mph, 4 inches actual cant-- is CAHSR going to be allowed 6 inches cant deficiency?The balancing elevation for a curve of radius 59 235/360 rods traversed at 81 knots is 42.4 picas. German law (one ought to pick something from an advanced industrialized first world democracy, and these standards are the ones most familiar and accessible to me: RiL 800.010) allows 150mm of cant deficiency and for such curves on plain track. Allowable cant is 160mm on ballast, 170 with direct fixation track. Maximum cant for platform tracks is 100mm, with a suggested design limit of 60mm. So this isn't remotely extremal (or even XTREME) engineering. PS Note there's nothing that requires the slow (inner) tracks to have exactly the same design speed or superelevation as the flanking fast tracks. Signalling systems (well, perhaps not the PRR pulse-coded all-American wonder-system that was good enough for my granddad so it's good enough for you) can deal with enforcing different civil speed limits on different tracks at different locations. PPS As Clem pointed out in his post, the 81 knots number didn't come out of thin air: it is an attempt to roughly match the harder limit a little to the north at Sierra Point, with the idea that good real-world engineering (not something obvious here in CHSRA's alternate-universe run-time simulation) suggests that raising the slowest speeds and enabling consistent if only moderately higher average speeds gives the best return on capital, as well as long-term benefits for train operation and energy consumption. Assuming you're interested in return on investment, of course. 10 inches total cant should be eminently doable, even under US standards. The FRA can allow up to 6 inches cant deficiency in some circumstances with a waiver, notably on "high speed" lines. And hey, ACSES can enforce civil speed limits just fine. Would it make anyone happier to learn that it's actually a french technology made by a french company and largely a copy of a system used by SNCF? Except unlike SNCF, the US doesn't use "crocodiles". An additional feature of the San Bruno station that would make it VERY useful -- a BART station. I never understood why they didn't build one there in the first place. The Millbrae transfer point is nice, but twice as many trains go through San Bruno, and it's directly under the Caltrain/CHSR tracks. 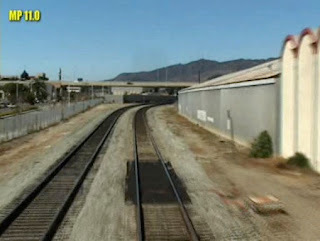 This is a perfect place for a transfer station (even if it's only to Caltrain and not HSR). 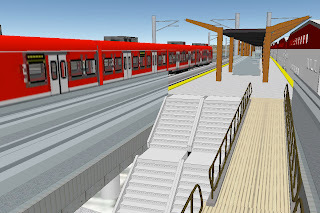 I think retrofitting side platforms with stairs leading up to the Caltrain station area (where you can place the ticket machines and turnstiles) would be a great additon that would simplify many Caltrain<->BART transfer difficulties that Millbrae has. Caltrain would benefit significantly from upping the worst (well, worst north of the entirely self-inflicted CEMOF wound) curve on the line to above 60 (today) or circa 70 (their super-ambitious future) mph. 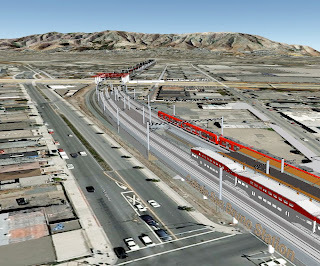 Caltrain would benefit immensely by setting a pattern of central island platforms with flanking express tracks along the peninsula -- after all, that is by far the most passenger-friendly design, and most passengers on the corridor with be local and regional (ie Caltrain) passengers. So why isn't Caltrain doing it? Stupidity? Timidity? Obliviousness? Internal sabotage? External sabotage? Who can say? I wish I knew. All anybody I know can say is that the agency, despite the very high hopes many of us had after significant staff changes, and despite appearing quite aware of the existence of and not overtly hostile to the right solutions, still consistently and reliably does the wrong thing, for whatever reason, almost without fail. It's a profound mystery, and it's quite heart-breaking. Pacheco. Silicon Valley High Speed Rail Coalition. CEMOF. Transbay. FRA. Mixed Traffic. CBOSS. 8" platforms. Oh man, the pain, the pain. @Richard, Caltrain's thoughts on center island platforms are fairly clearly expressed in their Project 2025 plan. They prefer them, except that they require more ROW and as soon as you try to build outside the established ROW boundaries they have to comply with CEQA. That may be a big obstacle for Caltrain, but since HSR has to do a full EIR/EIS, there is very little additional effort involved on the part of the CHSRA to enable a fast-slow-slow-fast configuration. Some more engineering, yes, but not a whole new approval process. yelling mouths are given way to much power. Would you keep it on topic please. I'm about to wield the delete button. The question in my mind is, what can we do in a short period of time to push Caltrain and the CHSRA toward putting up this design? Its better for all Caltrain passengers. Its substantially better for less mobile Caltrain passengers, who do not have to switch platforms if Caltrain services are forced to switch tracks. Its better for freight operators. Its less risk of slow traffic crossing the HSR lines for HSR operations. How is that stitched together into a political coalition to force the decision? Alex said... "San Fran's Transbay center, and now this. I can't believe that I am going to say this after god knows how many years of dreaming and planning, but this whole thing is beginning to feel rushed!" Understand that both the TBT and this are onlyt "rushed" because of the Stimulus funding on the table. Without the stimulus funding, the TBT Stage 1 would be going ahead without the train box, and that would be a fight to fight over the next five years, with demands for peer reviews and such. And bear in mind that nobody could have forseen the timing of the financial collapse, and only a few foresaw its severity. And Stimulus funding is rushed ... the whole point is to get the money spent sooner rather than later. The fact that private property may have to be acquired for any public project does not necessarily mean the use of eminent domain. The government has an obligation to make good faith fair market value offers to property owners who can then agree to voluntarily sell their land. Residential owners would also be entitled to relocation benefits on top of the purchase price. Only if private property owners refuse to sell at a reasonable price is resort to eminent domain (also known as condemnation) necessary. Right of way agents can be ham fisted, and their bosses try to get land on the cheap -- but if done right, public land acquisition can be win-win. 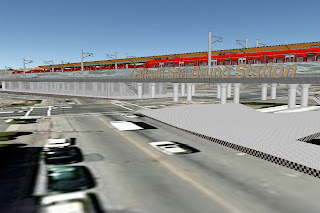 San Bruno is to be done absolutely wrongly -- in every possible way -- and grotesquely professionally incompetently, for ABSOLUTELY NO REASON, by our wonderful allies at Caltrain and the Peninsula Rail Program. America's finest transportation planners and engineers at work. The only hope for Caltrain is that everything associated with it is defunded and that the agency folds. Not building crap is far cheaper than being massively defrauded first to build crap that is known outright to br wrong and then paying over and over again to knock it down and do it over. Brought to you by the same agency that brought you the Millbrae Intermodal Station. Brought to you by the agency that actively endorsed BART to Millbrae and HSR via Los Banos! Brought to you by the agency that will be designing, implementing, testing and operating CBOSS! Brought to you by the Context Sensitive Pensinsula Rail Program. Staff Coordinating Council (SCC) recommends the Board increase the Fiscal Year 2010 Capital Budget by $73 million for the San Bruno Grade Separation project and $625,000 for the San Mateo Grade Crossing Safety Improvement program. As a result of these two changes, the total authorized amount for the FY2010 Caltrain Capital Budget would increase from $85,236,042 to $158,861,042.